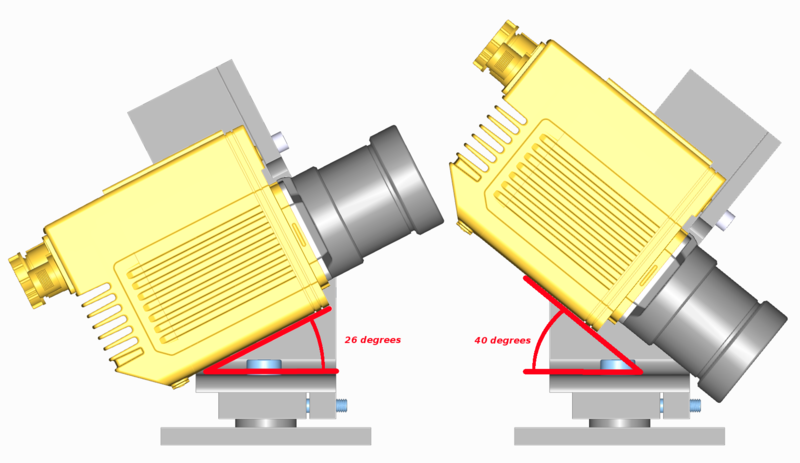 Pan and Tilt Axes are near the optical center of the imaging element, making alignment easier. Fine Adjustment of Pan and Tilt axes. 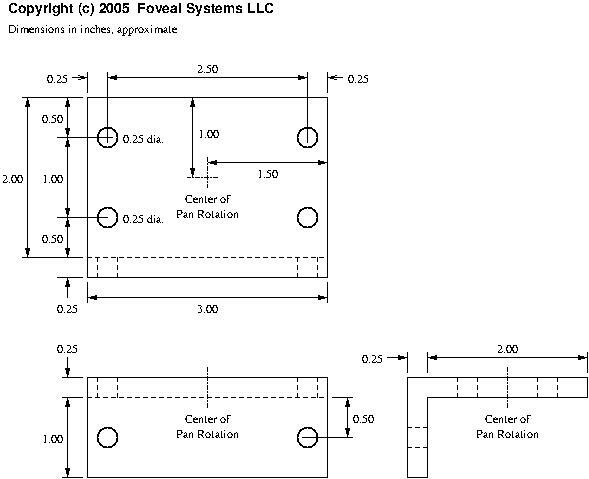 The Foveal 2-Axis Fine_Adjustment Camera Mounts, models FM1_2a and FM2_2a, are designed to match common machine vision camera mounting configurations. 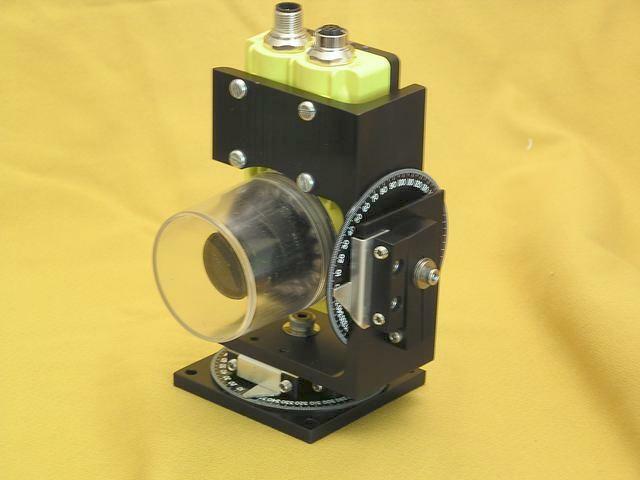 But a customer wanted something similar for the Cognex DataMan 470 series cameras. 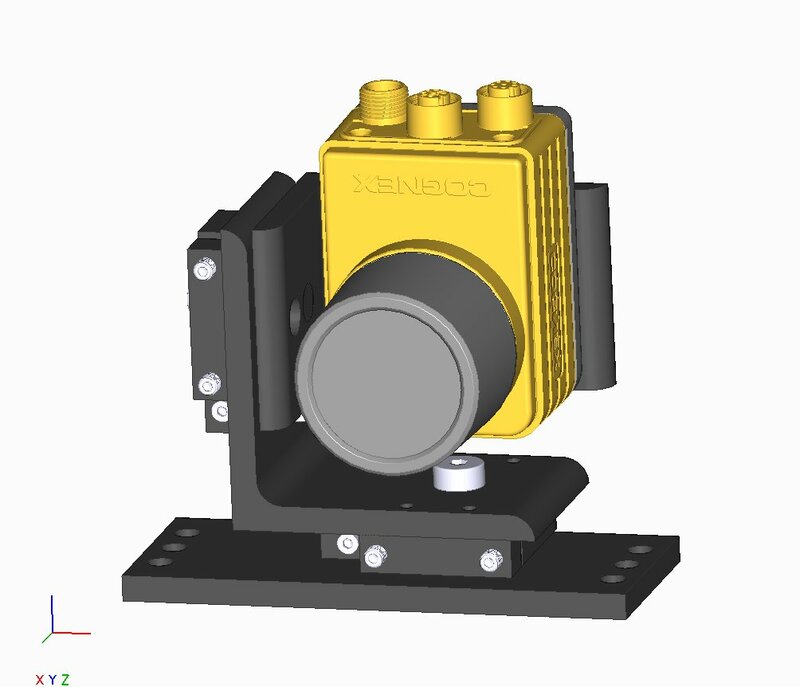 (Other cameras in the Cognex line can be mounted on the FM1_2a and/or FM2_2a mounts. See also the Cognex In-Sight 7200 Mount below). 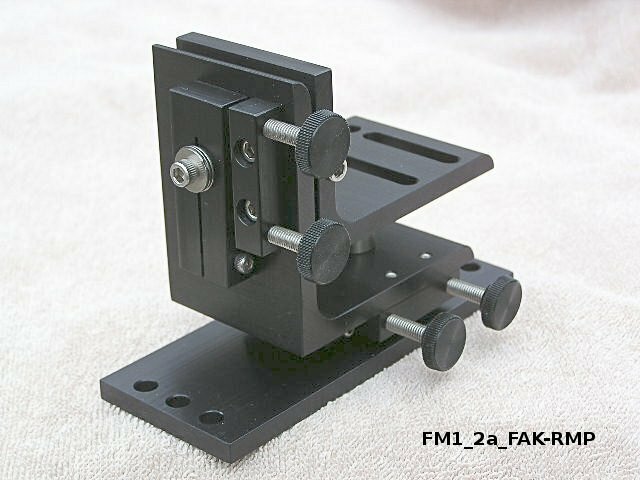 So we created the FM3_2a Fine-adjustment 2-Axis Mount. 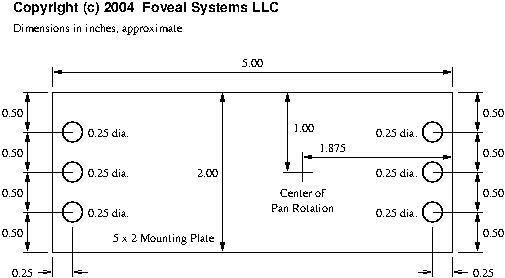 It shares the fine-adjustment features and mounting plate options of the other Foveal FMs (Fine-adjustment Mounts). 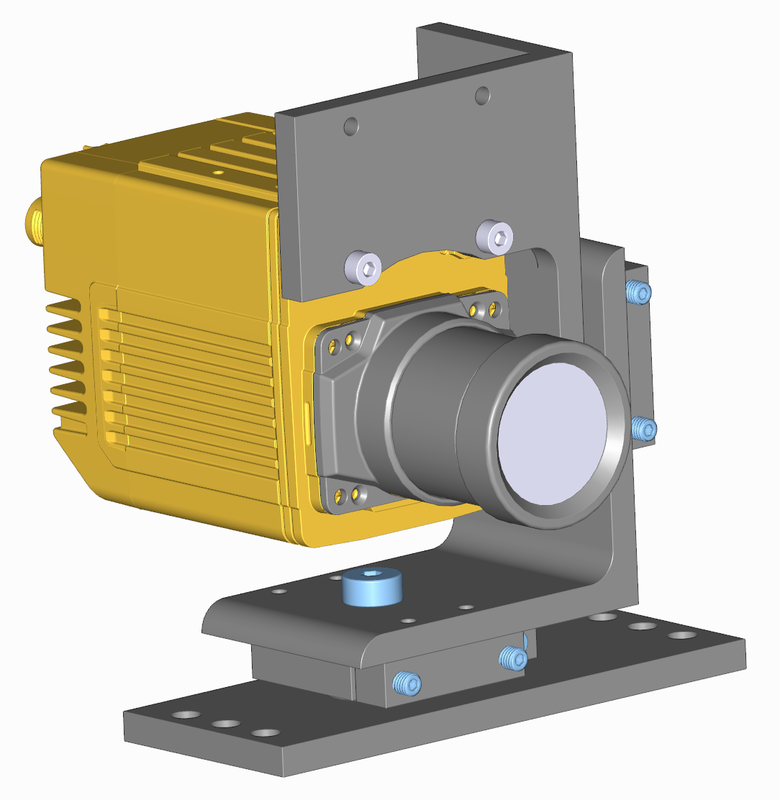 Because the FM3_2a is designed specifically for these make and model mounts, we optimized the placement of the Pan and Tilt Axes so they are centered near the imaging element's optical center. 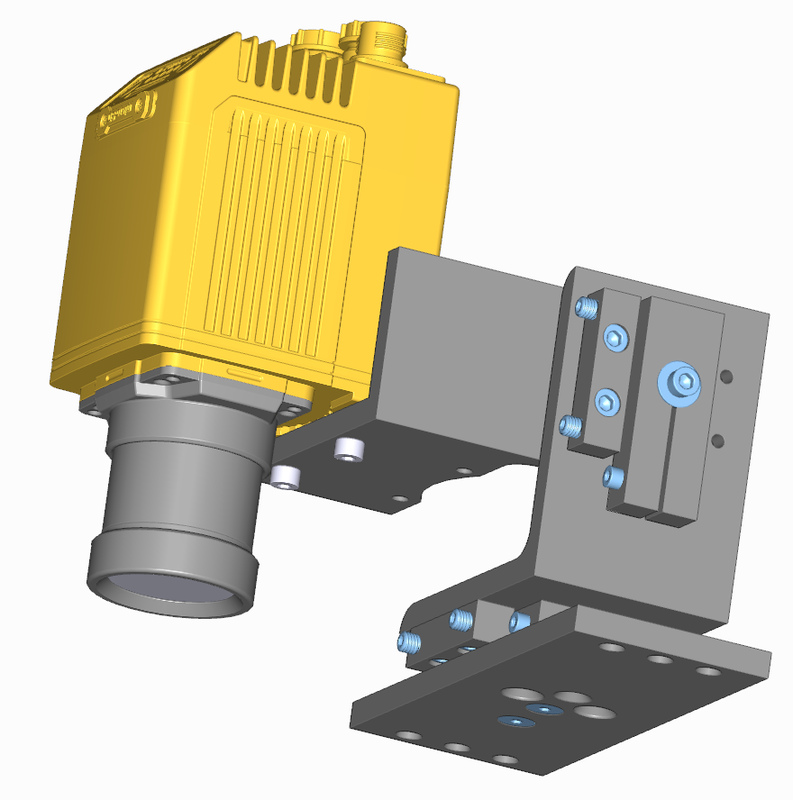 The 2-Axis Fine-Adjustment Camera Mounts may be supported with the base down or the base up. In either position, the plate the camera attaches to can be either below or above the camera. 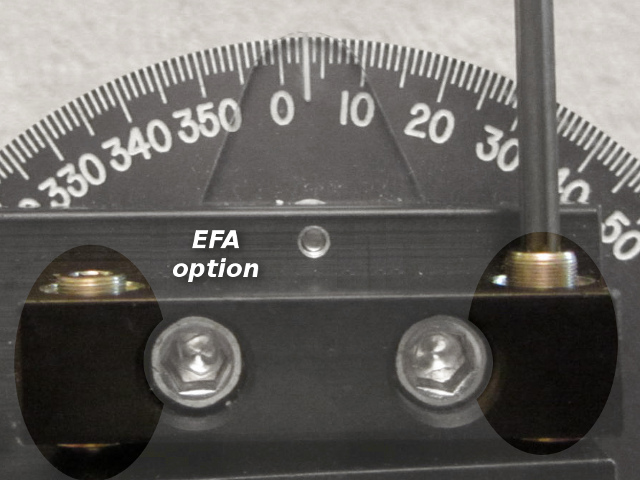 When coarse adjustments are unlocked, there is sufficient friction to hold the camera in position. Coarse position can be set by hand. 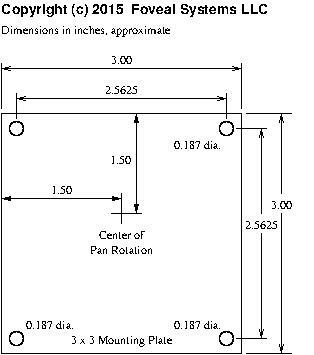 Independent adjustment of each axis means each adjustment does not affect the other. All adjustments and locking are made with a single 3/32 inch hex wrench. Reconfiguration is done with a 9/64 inch hex wrench. 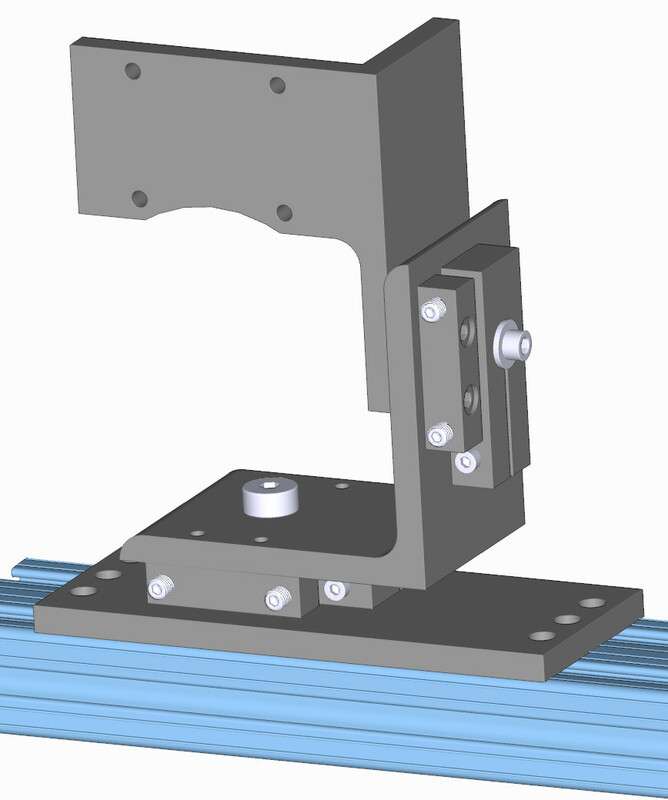 While not as robust as the Rigid Mounts, the Fine-adjustment Mount will work very well in applications where the mount will not be subjected to extreme disturbances. 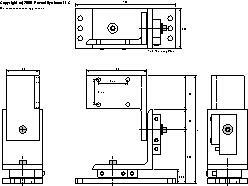 They are also suitable for mounting other types of instruments and sensors. 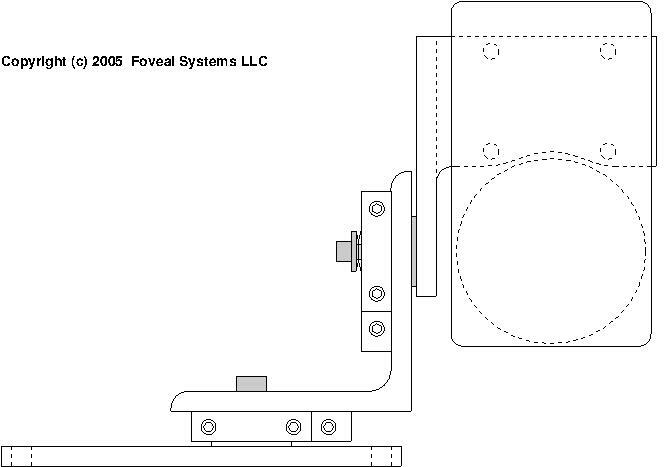 For more robust, two- and three- axis mounts that feature fine adjustment and locking of the pan, tilt, and roll axes, see the Foveal 2- and 3-Axis Rigid Camera Mounts. 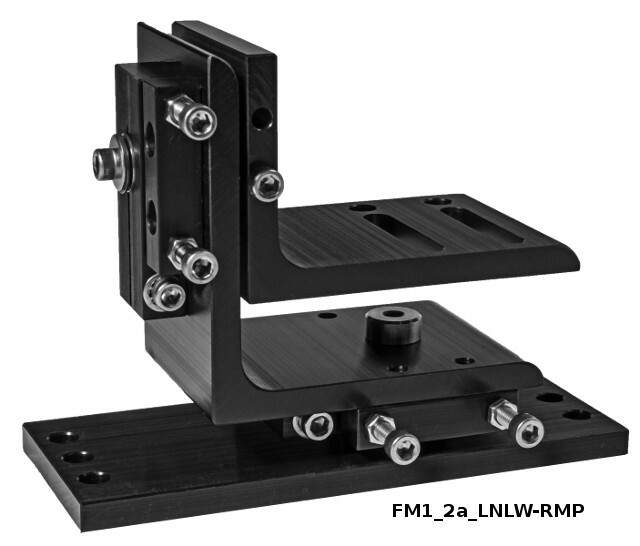 There are four mounting plate options for the FM mounts. Adjusting camera mounts can become tedious in tight or inconvenient spaces. 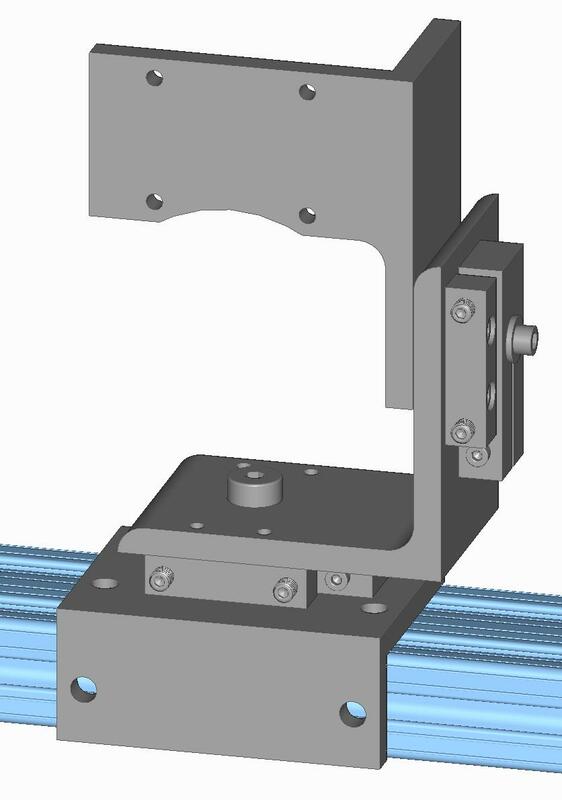 We have made the Fine Mounts customer-configurable, so alternative placements of the adjustment screws and the Tilt table are possible. For example, it may be more convenient to have the camera mounted away from the Pan axis. In particular, this allows the camera to look around a corner or down over an edge. Note that in this configuration the Pan axis does not go close to the optical center of the camera, although the Tilt axis still does. In this example, the camera can look down, or up, from a position well outside the mounting plate footprint. Note that both the Pan axis and Tilt axis are far from the optical center of the camera. Full Description These two mounts work well with these cameras. Both Pan and Tilt axes rotate near the optical center of the imaging element. 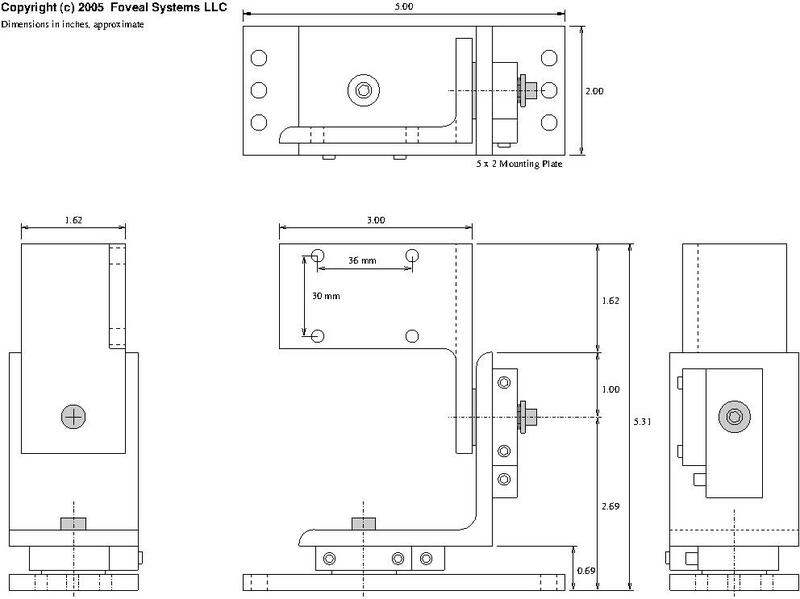 B & B Model Shop Services, Inc. is a partner in the design and construction of the Foveal Fine Camera Mounts.